Pavlova is a light and airy dessert that originated from New Zealand. Large disks of meringue are stacked high with whipped cream and topped with fresh berries. If you are preparing pavlova for passover, make sure that you are using all kosher ingredients. If this dessert is for another occasion, you can consider layering the meringue with lemon curd or salted caramel sauce. 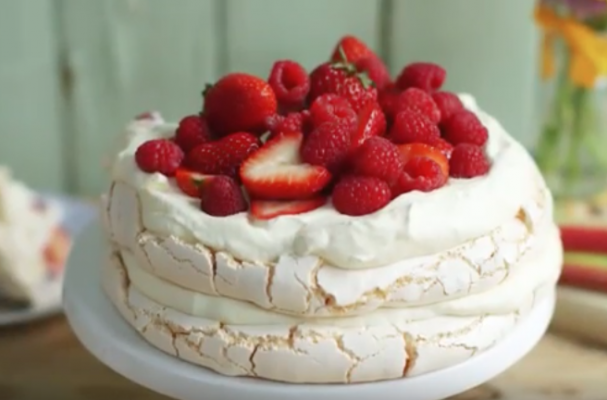 There are some many ways to make a delicious pavlova but this version is truly my favorite. Nothing compares to sweet spring strawberries, fresh whipped cream and crunchy meringue.